Fan tail gear train un-seized and reset. One truck wheel reset. Cap turning. Painting cradle built and all surfaces painted or tarred (using brushing tar). Window and door frames replaced. New lintels on doors. Dust floor replaced (the old one was well rotted). Other floors repaired. Outhouse roof and fanlights repaired. Duck boards round cap repaired. Old stocks (still lying in the garden) were drawn. The wood was pitch pine. Wallower re-aligned. New (beech) cog blanks cut. Re-cogging in-situ planned. Brake wheel wedges replaced. 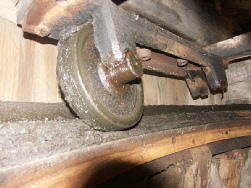 Further re-alignment of truck wheels and tail bearing allowed Brake wheel and Wallower to be disengaged. 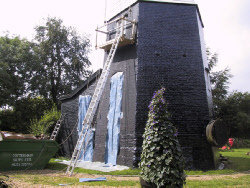 West face re-tarred with hot tar - result successful. Later in the summer, the rest of the tower and outhouse were re-tarred. Fitted wallower cog blanks and cut profile in-situ with chain saw. Upright shaft and wind shaft now turn easily. Brake adjusted by shortening one shoe. Ball and finial filled and painted. Wetness tests showed the internal surfaces now drying out. 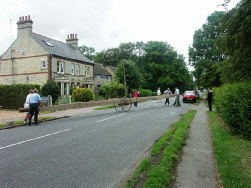 One stone fell over - probably as a result of the Dudley earthquake. Re-worked the fantail bracing which was extremely loose. Stripped, replaced rotten weather boards and repainted the smock. Underneath the weather boards are the old black, vertical boards, complete (in places) with a tarred canvas outside surface. Mill flooded in the winter - plans laid for a sump pump. 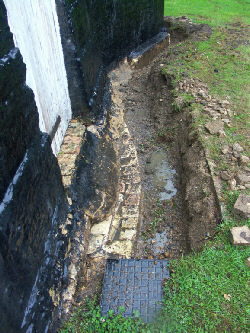 Drain and sump dug outside mill, pump fitted to clear water to the pond. Stocks ordered from Sweden (though the timber was cut in Poland). Visited the saw mill and arranged for rough cutting and microwave drying! Stocks arrived and transported using the timber bob. Planing, shaping and drilling completed and painting begun. 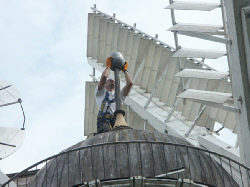 Fan removed, iron work refurbished and painted; new blades made; reassembled and working well. Strong winter gales gave it a severe work-out without any problems. Drew up sails (“whips”) using the 1916 picture of the Wilsons and with reference to other East Anglian Mills such as Wicken (where they found an original whip). Mill proof tested to check that it was sound enough to fit sails. Stocks completed and raised (29th August) by hand with a team of 7 people. Clamps completed and fitted in October. Wood for the sails was ordered from the same Swedish timber yard and arrived late in the Summer. Shutters and all the small castings ordered from Dorothea Restorations. Cap stripped of the old cracked canvas. Some rot found, particularly where the brake chain passed through it. This was re-rooted through a tube on the inside to remove the weakness. Striking gear metal work refurbished and re-painted in preparation for the sails. Rotten planks on the cap replaced, steaming the wood to the curve. Sails built and fitted (October). 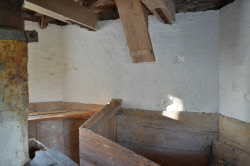 As with the stocks, they were raised by hand: on the first day, one pair was installed and at the end of the day, the mill was turned by the wind with just these two. The first time for 77 years! The second pair were done two weeks later and a friend took a picture of it from the air. Lots of visitors dropped in every time we ran it! In February, the Market Rasen Earthquake produced Richter 4 shocks in Cambridge and displaced the bogie on which the cap runs at the front. One wheel ran right off the kerb and fell to the dust floor. All was restored using bottle jacks to raise the cap and manual replacement of bogie plus wheel. 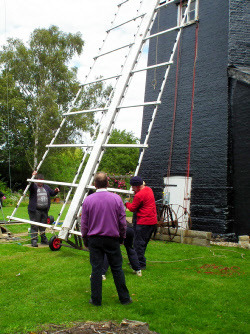 The sails were finished off by fitting the backstays. The finial was rebuilt to the design seen in the 1916 picture, using a London lamppost for the spike and a sycamore tree for the acorn (covered with lead by spinning). 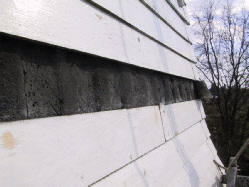 The lead flashing around the crown was replaced with deeper welts and no nails to make it more weather proof. The cap was recovered with canvas (“marouflage”) using linseed oil paint as the adhesive. A 2 year trial of this technique had shown that it remains flexible, accommodating the movement of the woodwork. With lead from the old finial, the sails were balanced. The brake wheel and wallower were re-aligned. 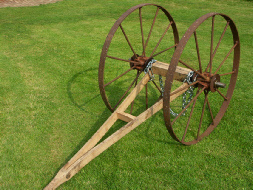 The truck wheels were each removed, refurbished (many were bent) and re-centred. A new, all metal, painting cradle was built and commissioned to paint the smock. As before, about 20 planks had to be replaced. Work began on stripping all the woodwork of the fan tail platform. 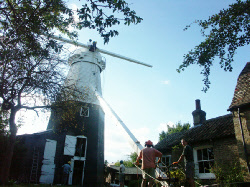 All the restoration has been carried out by Steve with help from friends. Much research has been carried out into methods and designs, so that the work is as authentic as possible. This includes raising the stocks and sails by hand - no cranes used! Completed stripping and painting of fan tail platform. 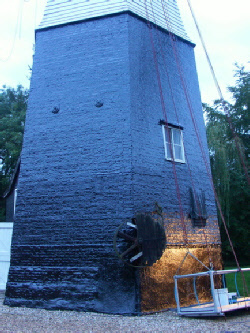 Tower re-tarred using an IR lamp to melt the old tar and fill cracks, followed by Koppers Special Pitch No. 5 to recoat. This was much the best combination tried and the easiest to apply. Fan tail duck boards replaced with aluminium tube (for durability and stability). Balcony removed and refurbished, new aluminium boards made, puncheons cleaned and covered with canvas to preserve them (one side completed). Most door frames and woodwork in the tower re-furbished. 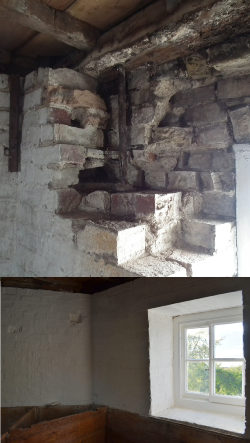 Internally, much cement render was removed from the walls - revealing considerable damp problems, now drying out before re-pointing and applying whitewash next year. The major work of the year was to dig a ditch all round the mill and back fill it with shingle to improve drainage and reduce the amount of water in the walls. There was much frost damage at and below ground level, and subsequent to this work, no further damage has occurred despite the harsh frosts in the winter. In digging the ditch, it was found that the hexagonal base had been built on an earlier round one - probably the roundhouse of the original post mill. Examination of the bricks suggested a date of 1620, but a small number of 16thC bricks were also found. 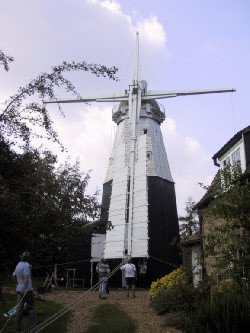 This puts the post mill to a much earlier date than previously thought, and may even take it back to Tudor times. Disappointingly, over the winter the re-tarred areas at the bottom of the tower suffered frost damage. 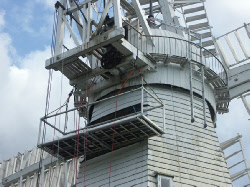 They will need to be re-coated, but damp checks indicated that they were not sufficiently dry by the Autumn. 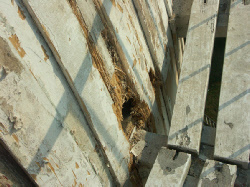 Internally, the plates on which the major beams in the tower rest have been rotten for many years. We started a programme to jack up the beams and replace the plates - a job which will extend into 2012. Two sails were removed (by hand) and refurbished. The canvas on many shutters had rotted, and these were re-covered. The source of the rot was fungus growing on the linseed oil paint. A new supplier has been found who includes zinc oxide in the paint which acts as an inhibitor. 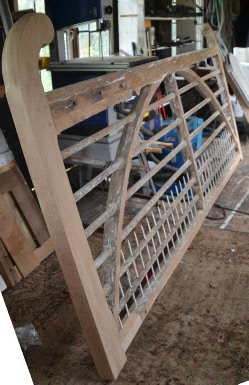 The rest of the woodwork was in excellent condition, including the vital centre section of the stocks where they pass through the canister. The second pair of sails were removed and refurbished with only a few shutters requiring re-canvassing. The Bins floor has had major attention. The beam supports are finished and the rear window has been replaced. This required a new lintel, and re-working of quite a lot of brickwork. 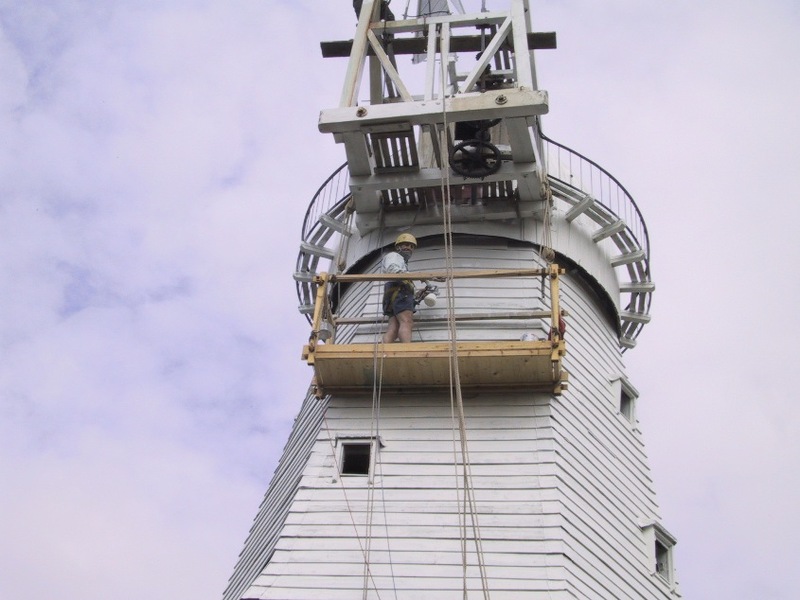 This revealed that the Smock had originally been tied into the tower by bolts fitted into baulks of timber enclosed in the bricks. 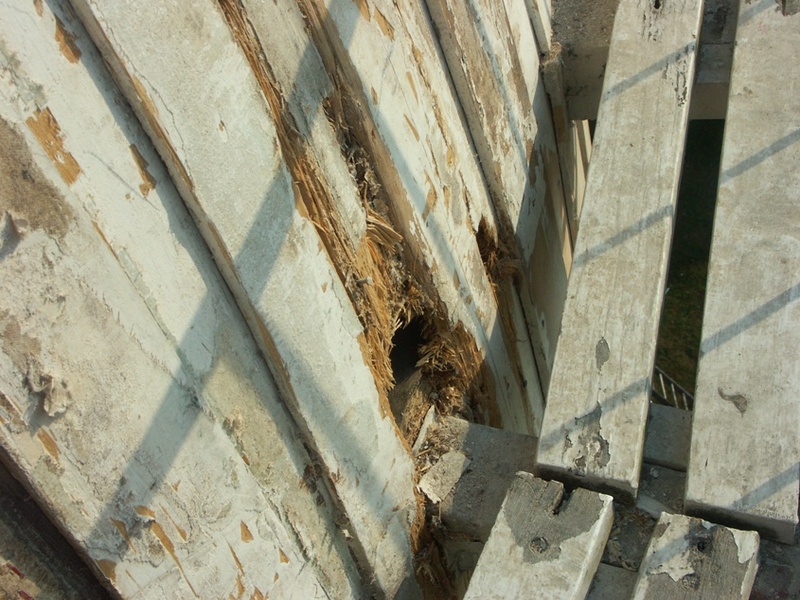 These timbers have rotted away to dust - so for many years now, the Smock has sat on the tower without ties. We did not try to replace these ties - it seems unlikely that they would have had any substantial merit, and the Smock now has a strained wire round it preventing it from spreading. This was installed in 1985 and is probably quite sufficient. The remains of a fireplace were discovered in the Meal floor. A number of local mills have fireplaces despite the risk of igniting the flour. The Bins floor has been finished, with renewed wall plates under the beams, new lintel for the rear window and the brickwork stripped down, repointed and whitewashed. Similar work has been started on the Stones floor. The boulter (sieving machine) has been partially disassembled ready for refurbishment, but turns out to be rather difficult to strip, partly because of rusted bolts and partly because of the way it was originally assembled. This is going to be quite difficult to do. The beautiful “Rectory” gates to the front drive have been extensively repaired and are awaiting painting and re-hanging.